This tub looks basic enough. 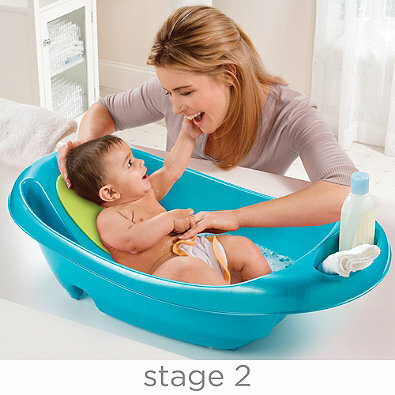 A basic, white toddler tub, with an infant insert that can be placed vertically or horizontally within the larger tub. Foam backing to keep the baby from sliding, and some small accessories. 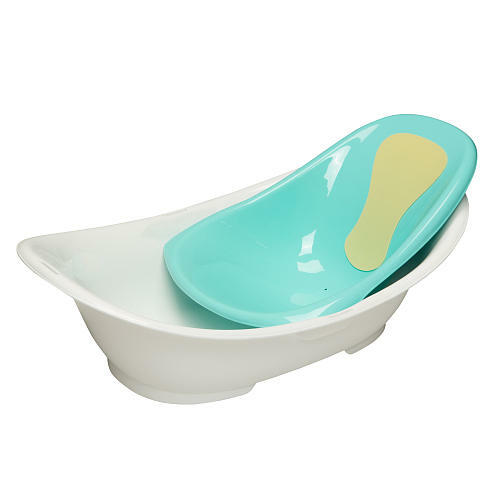 The small infant tub has holes so that the infant isn’t actually sitting in any water, but the water is draining into the larger tub. I found this tub to be totally impractical. 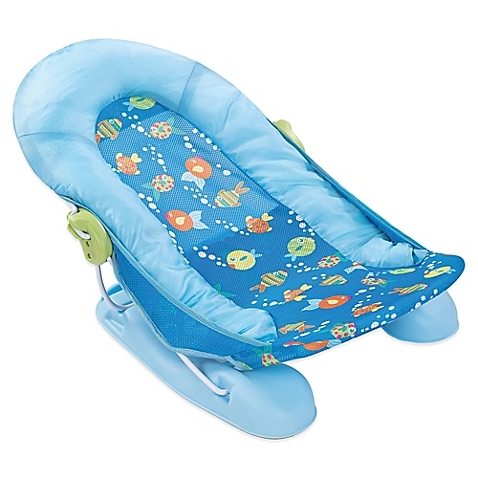 My LO was nowhere near stable enough to even use the infant insert, and by the time he was, he was too big. The infant positioner seems to have a very low weight limit, and my LO slid all over the place. It took forever to clean up, having two separate pieces. There was nothing I ended up liking about this tub. Sure, they include some accessories… but not one of them did I actually use. Perhaps Lucas was too wiggly for a tub like this? Either way, not my top pick. I knew I wanted to get my LO sitting up and more stable. This tub has a recline position, and a spot for them to sit up straight. The reason I purchased this tub? You fill it with water and it’s all secluded to that one spot. No momma hairs floating in the water to get stuck to or wrapped around your LO. 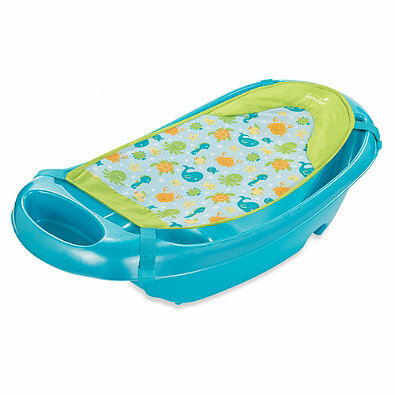 I do think this tub is better for babies with some control. My guy really started using this tub all the time around 4 months. Otherwise, they slide all over still. 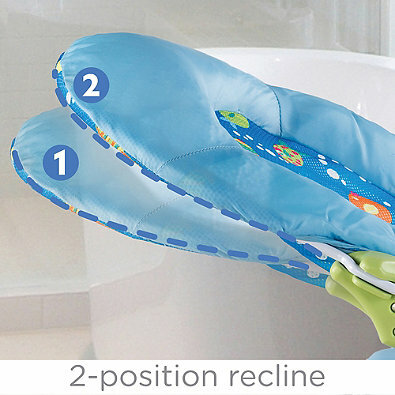 Putting a towel down inside of the tub helps with some slipping until they have better control. Once bathing is done, easily dump the water and store your tub. It’s a no fluff/frills kind of tub, and I think that’s why it’s fit our needs best. 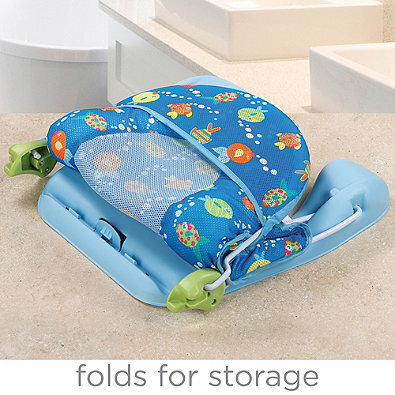 This also comes with an infant sling that can be attached to the tub, and MAN do I wish we would have had this when our guy was small enough to use it! This tub was perfect. It was the cheapest of the three, and by far what I would pick of the few tubs I tried.